We, monks, are thankful for the place and surroundings where we are living. ‘My place grounds in this earthly life’, sings the psalmist. 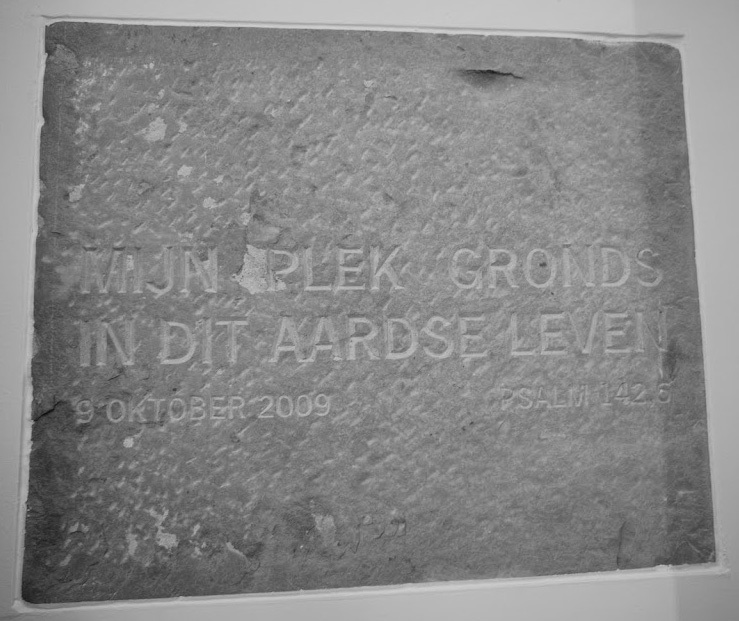 This verse from the Psalms is chiselled in the first stone of our new monastery. Enjoy glimpsing into our monastery, ‘our’ nature and our surroundings. In the middle of our church, in our ‘living room’ lies the first stone of our new monastery. Why? The secret of this stone is engraved into it: my place grounds this earthly life. Verse six from psalm 142, the one we just sung. A word from our book of Psalms, our prayerbook, that is so much more than a book. For us it is like a living being who speaks, who speaks to us, who suffers and sighs, who exalts and sings, who for us and many others is a companion through thick and thin. My place grounds this earthly life. What does this secret say? The psalm is about God himself. The distant, unnameable God is called: my place grounds this earthly life. Are these pious words? Do we not all know the experience that in our lives things happen through which our home becomes a strange home. If there is no refuge anywhere, if the ground under our human feet collapses, than this word from the Psalms says: God is here and we may call Him – my refuge, my place grounds this earthly life. With diffidence do I say these words for the experience of many people goes into a different direction. Is there such a place? If there is no one, do I not fall into a bottemless hole? Us, brothers, have been called here together to live these fragile words in faith: God – my place grounds this earthly life. In this way our home ground our place in this earthly life. Our monastery wants to be a building where this secret can be lived. It is our house, our home, because the One in whom we may trust gives it strength. And this not only for ourselves. Ultimately, we are people on the way – passers by. It has something of the taste of a hiding place. For us, but we ope also for coming generations. For is it not so that the human person – no matter how he evolves – always continues to be confronted with the question: where is our foundation? In what or whom do we find our support? Where is our place that grounds this earthly life? We hope and trust in this way to arrive at the sixth verse of psalm 142. The stone that may ‘picture’ this now lies in our midst. Therefore it is not simply a stone. Also literally. Our architect, Bob van Reeth, brought it to our community as a gift from Molesmes, the Frence Benedictine monastry from where 21 brothers left 21 years ago to establish Citeaux, our mother monastry. The stone also points to our roots. It is not a new stone – it was not invented but found. It carries the centuries within itself, a whole tradition. So it pictures also our new monastry. Bob told us several times in relationship to the concept of the monastry: “I did not have to invent anything, I found and this I translated into a contemporary form”. To this work of translation many contributed and continue to add. Soon we will carry this stone to its new place where it will be inserted in the construction, in the working together of so many human hands and human heads. An old stone – tradition, that which is passed on – will be placed between new stones. Cornerstone, foundation stone – precious are these vulnerable words, dear for all it carries within itself – a pointer to the One who gives steadfastness to human life.